Very few things match our passion for epic food. Whether its growing the fruits, shopping for inspiring items, preparation of meals or sharing great wine, food and stimulating conversation with our friends, it all rocks our world. In fact we think nothing is more important. Cooking and all that it encompasses is one of our great joys and inspirations. The center of our food world is the City of Berkeley. There are so many exceptional food stores that we can’t possible mention them all (but we will try over time). Our trips to Berkeley rarely start with a specific recipe or dish in mind. We let what we find on the treasure hunt influence what will be created. Our first stop is often Acme Bread http://www.acmebread.com/locations. Many Bay area locals are familiar with Acme, as many grocers carry a selection of their breads. What’s different about visiting the original bakery is the smell of the ovens and the scene of active bakers working to make some of the best bread around. They also have an incredibly large selection of breads and pastries that you will not find anywhere else. Look for the Pizza Bianca, the Edible Schoolyard Bread and the apple turnovers. The croutons are also epic. The next and most important stop is Monterey Market http://www.montereymarket.com. 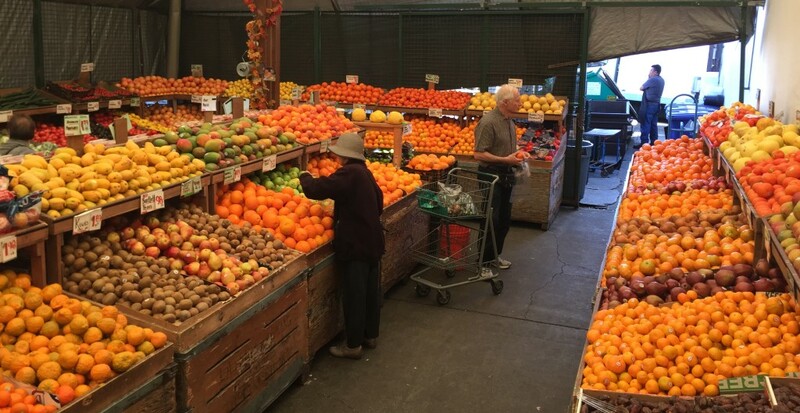 Its hard to explain in a few words just how incredibly wonderful this produce market is. In any given season the bins overflow with a variety that simply takes our breadth away. In late winter, dozens of varieties of citrus are on display. In early summer it is stone fruits and berries, later brings the bounty of summer with melons and tomatoes, tomatoes, tomatoes! Much of what is displayed is direct from producers. As farmers we especially like that most labels include not just the variety but where it is grown, how it was grown and who grew it, really delivering a sense of place. As we stroll through the isles, so many cooking options spring to mind that it is hard to contain our excitement thinking about what will follow in the kitchen and on the table. Our last stop is the Cheese Board http://www.cheeseboardcollective.coop. A worker collective since the 1970’s, we come for the cheese although there is always a line for the exceptional pizza and bread. The selection is remarkable, but what sets the Cheese Board aside is the people (the same way we feel about wineries). When your number is called, a delightful someone who knows more about cheese than you can possibly imagine guides you to cheese nirvana asking just a few questions before producing samples of cheeses from the original wheels (not small plastic wrapped packages). Like the rest of Berkeley , The Cheese Board is a true treasure hunt and we always feel that we walk out with special treasures we can’t what to share with others. Go and visit Berkeley. We are certain you too will be inspired! Soil and habitat improvement is always on our minds. Each year, we craft blends of seed to plant that will benefit both the soil by building organic matter and will benefit insects, bees and birds by providing food and shelter. The seeds we planted this year to build our soil include Magnus Peas, Dundale Peas, Common Vetch, Bell Beans, Barley, and Oats. For the bees we planted Yellow Sweet Blossom Clover, Hykon Rose Clover, Persian Clover, Alsike Clover, White Dutch Clover, Alfalfa, Nemfix Mustard, Bracco Mustard, Common Mustard, Canola Mustard, Daikon Radish, Calendula, and Phacelia Tanacetifolia. It may seem like a lot of different types of seed, but each supports a different function or bloom time. 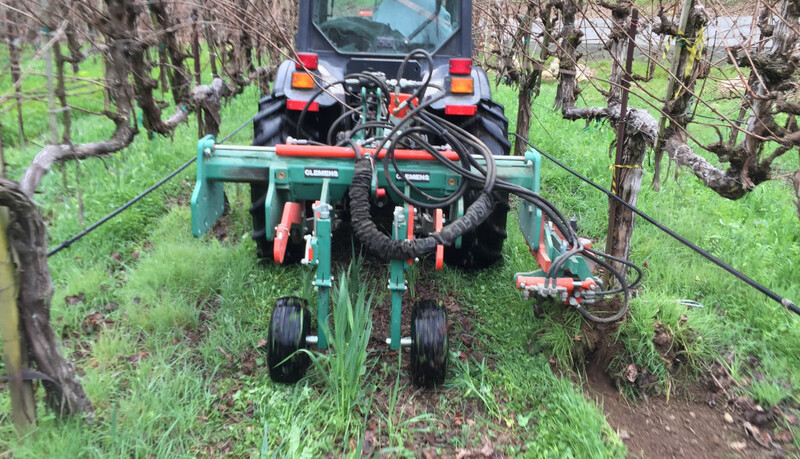 We don’t use herbicides on our vineyard and just now we are cleaning up under the vines with our Clemons Radius XL weed bar. It cuts the plants off just under the soil and leaves them to provide mulch that will help build soil carbon over time. Healthy and happy bees create hives by swarming, a natural occurrence were hives split into two groups. The queen leaves with half of the hive, while the other half stays to support a new queen in the old hive. We encourage this type of hive reproduction by moving the queens and bees to new hives prior to swarming. We selectively pick the hives to split based on traits that indicate better genetics. This way with each generation we are hopefully breading bees that will better survive in our local environment without having to use chemicals or medications. We call this doing splits. 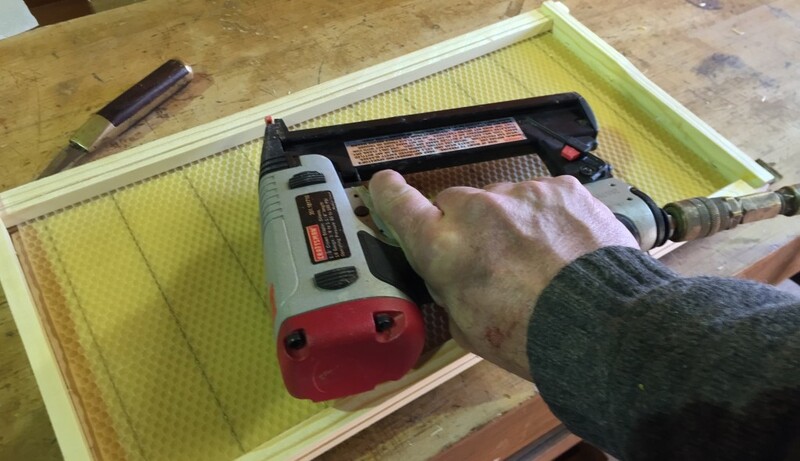 In January and February, we build new boxes and frames to allow our bees the room to grow. I might add that the dry and warm 2015 winter has made for some very happy bees for this time of year. All of our hives are strong and look ready for a productive year. Why Balsamic? We are often asked why we started our first batch 17 years ago and it is still in the barrel. 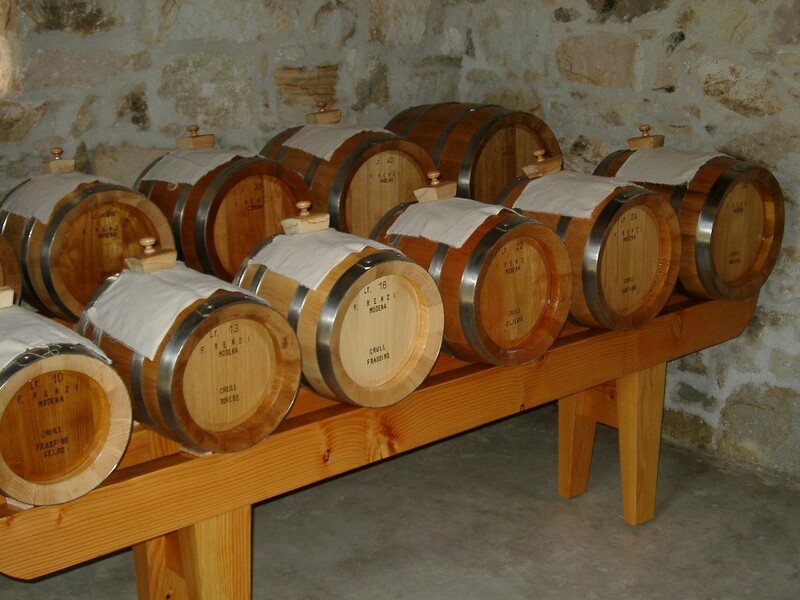 Our love of balsamic and the process stems from the historic role of balsamic in the families of producers in Italy. Balsamic more than just about any product we know represents a family and its commitment to future generations. Because of the way we move vinegar from barrel to barrel each year and never empty a barrel (the solera process) every barrel will always have a part of every person ever involved in its production. Each generation will share with the next. We find this terribly romantic in a world of immediate gratification under the constant presence of the digital age. With each passing year the vinegar gets better and better and over a lifetime it becomes something you are proud to leave to your children, we find this inspiring (and delicious) on so many levels. We love bees. Many years ago our son and daughter introduced us to bees. Yes that’s right, learning something from your kids. They attended the Saint Helena Montessori School and had a teacher, Rob Keller that inspired a love of bees. After reading about the plight of bees throughout the world, I thought that maybe we could start some hives and try to keep bees in a sustainable way. What started as a couple of boxes are now 20 hives located throughout the ranch. The more I work with bees the more I am amazed at just what they accomplish. Sure, they make honey, but they also pollinate much of what we eat, and as you delve into their hives the incredible society that they have and the comb they build are truly inspiring. Understanding the bees diet has also caused us to re-evaluate what we plant as cover crops and as landscaping. Trying to insure a year round supply of nectar and pollen is a primary consideration for plant selection. When visiting, Timm will be more then willing to spend some time talking bees. Burning Man becomes our home for one week each year. It is there that we are exposed to creativity that blows the mind. We meet people that inspire. We hear music that makes us dance and we are reminded of just how wonderful this world of ours can be! 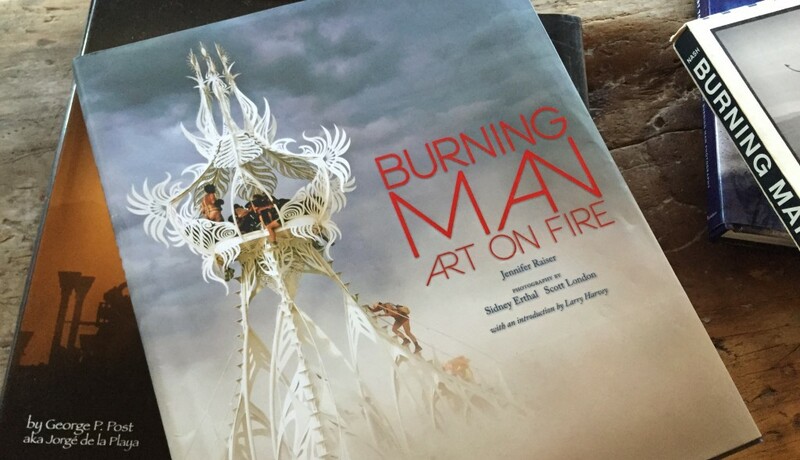 A good friend Jennifer Raiser recently authored a new book “Burning Man Art on Fire”. Quite simply a must have book if you are interested in Burning Man. It covers many years of art, following different artists as they interpret each year’s theme. Great photography that make you long to be back on the playa.